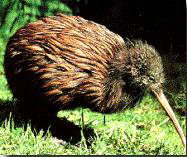 other characteristics: The Kiwi is one of the few birds worldwide which cannot fly. It is the only bird without visible wings. It doesn't need those as there are no natural predators on the islands. They just came with the seddlers from Europe. The clumsy looking animal is the symbol of New Zealand. It also gave the name to the fruit and the inhabitants. Kiwis live their whole live with the same partner in an area of about 4ha. About 20hrs a day the night-animals sleep in their caves.